How Much Should We Tell Children? | How Do You Do It? How Much Should We Tell Children? The recent events in Paris are unthinkable. The unlivable circumstances in Syria defy reason. The devastation in Beirut is horrific. There is so much ugliness in the world. I don’t believe in shielding my daughters completely from what goes on outside our immediate sphere, but I also think that it’s my job to mediate this knowledge and protect children’s right to feel safe. All we parents are back in the quandary of talking to children about terrorism. There’s no one right way to approach it. I had the radio on for a little while driving, but the children were too absorbed in their books to notice what was being said. If it were a different week, I might have chosen to mention the Paris tragedy to my girls, but they’re already dealing with a challenging time within the extended family. Tomorrow, my 9-year-olds will be back at school. All I can do is prepare myself for any questions they ask and reassure them that they are safe, that our little suburb is too unimportant to be a target, and that Daddy and his soldier friends are out there keeping us safe. Much as I hate the apathy of the Western world toward tragedy occurring outside our borders, right now the mother in me is grateful. That very apathy is keeping my daughters from feeling that grief, anger, and fear that the Paris attacks have brought me. This morning, one of my girls asked me about the Paris attacks. “Mommy, there were bad guy shooters in Paris?” I told her that there were. Her sister had been entirely unaware and wanted details. I just told her that some bad guys decided that shooting a bunch of people would be a good idea, like on 9/11. Then my first daughter asked whether it wouldn’t make sense if the news people only broadcast kid-friendly stories during the time that most children were being driven to school. I told her that it was parents’ responsibility to determine what’s appropriate for their children, not journalists’. There are plenty of stories that I choose not to let them hear, but I strike a balance between letting them know that people in the world are generally good, but that there are people who make really bad decisions. Unless we have some awareness of the suffering of others, we wouldn’t be able to fully appreciate what we have. Once again, my children clarified for me parenting decisions that I was over-thinking. Whatever I may be teaching my children, they teach me so much more. I was just having this conversation with Cat (Juggling Act of Life) this morning via her blog. Having children brings in an entirely new level of grief around such a terrible situation, in knowing that you have to put into words for them what’s going on. Our girls are not quite 7, and I chose not to say anything to them about the Paris attacks. We’ve had some conversations here and there about other tragedies, but I still have the “luxury” at this point of being selective with what they consume. 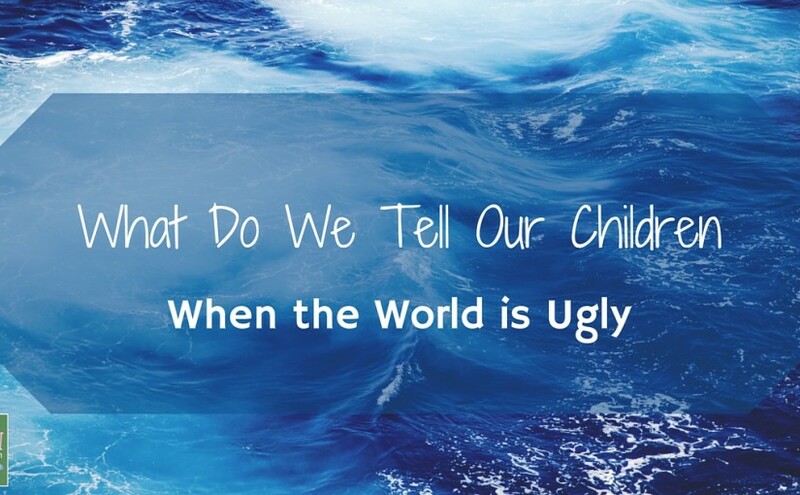 I can’t imagine having to explain to my boys about all the ugliness in the world. I’m not sure I would know where to draw the line between whats good for them to know and what they should never have to find out about. Thank fully I have a couple of years still, but I know i’l have to make the same decision one day. So sad. Well done on handling it so well. She’s a clever one, isn’t she? My perspective is that if I protect my children too much, they won’t have the grit to make it when I’m not around to protect them, which will have to happen eventually. Like every other challenging part of parenting, it’s about striking a balance. Mummy Fever recently posted Learning to ski: what’s the best age? That last line brought a tear to my eye. This is a really powerful and important topic and it sounds like you handled it beautifully. My son is only a toddler but I often think about I will approach topics like this in the future. Thanks for sharing. Mine are both too young to really pick up on news stories yet but it’s only a matter of time. I have the added complication of autism, as well. Tyger is very sensitive and finds it hard to make sense of what other people do at the best of times. I don’t know how I’ll deal with this sort of thing when he’s older but I’ll probably take his lead. Lady Nym recently posted What If There Was a Cure for Autism? I hadn’t even thought about the additional challenge special needs would present. My girls’ are “special” in that they are very intelligent, which means that they see through any effort to whitewash or oversimplify explanations. The only autistic children I’m close to are either non-verbal or with very low verbal ability, so I don’t think they could understand what happened. I’ve had to have completely separate talks with my 10 year old (who understands a lot about the world – and has read extensively about historic events like World Wars, tragedies, and the Holocaust) and my 7 and 6 year olds, who believe that bad guys are mostly made up by animators at Disney. Except the ones PopPop (a police officer) “puts in jail.” It’s a testament to all their good character that, no matter how much they understand or don’t, their first reaction is to say “How can we help?” I’m trying to teach them that the most important thing they can do to help is grow up to be understanding, forgiving, and accepting of people from all backgrounds and cultures – because a world where we don’t fear and hate one another is the only kind of world where there can be peace. You must be so proud of your children’s big hearts. Dealing with the different maturity levels isn’t something I’ve had to tackle, since my twins are very closely matched. I’ll keep your approach in mind if I ever have another (likely through adoption). Beautifully written and a problem that we all face. I chose this time to tell my 9 year old about Paris as she had asked lots of questions about the last terrorist attack there. This time it doesn’t seem to have caught her in the same way. It’s such a difficult area but I think she knows that we are quite an open book and there will be times when we will censor things that are not necessary for her to see and hear. Of course, they also talk about it in school and observe the silence so complete censorship is not always an option. How lovely if your daughter to say you had the right balance. The Tubblet is 12 and we made a point of speaking to her about it before she started school that week. Partly because we wanted to talk to her about Muslims and refugees to make sure she didn’t pick up any bad ideas at school. There’s a lot of prejudice around at the moment. It sounds like your girls have handled what you have told them really well and I agree with your daughter that you have a good balance. It is horrible to have to explain the ugliness and hate that exists in the world to our children. I am thankful that as yet, my children are too young to be aware of what has been happening in the past week but one day I will have to explain these things to them. Terrifying isn’t it? And awful that have to try and find the right words to explain these atrocities to our children. Particularly when we don’t really understand how other humans can be so heartless and evil ourselves. I’m dreading the day I have to talk to my babies about this kind of subject. Thanks so much for being such a fab co-host! #TwinklyTuesday One more week for us Sadia!!! !